Anyone who was unfamiliar with the ideological world of primary education would rub their eyes in disbelief after reading the official guidance on EYFS assessments. Never mind the reliability–it’s hard to say exactly what’s being assessed. Any test or assessment which measures complex behaviours tells us very little about individual stengths and weaknesses, or in fact what children have learned and what they haven’t. Wiliam and Black notwithstanding, it’s very easy to test simple behaviours, such as knowledge of gpcs and blending skills or whether a child can count and add single-digit numbers. Five-year-olds are not too young for such simple assessments, which have the advantage of being easily administered. Even more to the point, they serve to focus teachers’ efforts on concrete and do-able tasks. I’m hoping that Katherine Birbalsingh succeeds in her aim of starting an all-through 5-18 school, where I am sure we will find out how much more children learn when teachers aren’t waiting around to observe ‘child-initiated’ activities. Am I the only one who finds the notion of learning through ‘child-initiated’ play a bit creepy? Of course adults should cast an eye over young children’s play to ensure that no one is getting bullied or hurt, and adults should play games with children or even just mess around with them. It’s natural, even with a lot of animals. But the idea of teachers watching kids’ spontaneous play and then trying to nudge their play in a desired direction just seems a bit pervy to me. Yes, I find it all a bit creepy too. Regards your comments on what is it actually being assessed – there are more posts to come! A number of us have been discussing your comments and would like some clarification / elaboration on why you consider such interaction with children to be ‘pervy’. Additionally, we are interested in what is meant by ‘messing around’ with children like animals do. It’s not Percy at all with really young children- two year olds for example. That’s what parents naturally do with their young children. The problem with the eyfs framework being used in schools is that it is birth to five, and not so useful for children at the older range. It’s hopeless for summarise assessment. We ignore most of the strictures about stuff being child initiated for assessment purposes- it’s unreliable, inefficient and pointless. A couple of reception children did the year 1 end of year maths assessment last year and did very well. Big argument with moderator who said we couldn’t use it as evidence that these children were ‘exceeding.’ Complete nonsense! Madness that you weren’t allowed to use a maths test. Particularly an issue in maths with the presumption that, what is by nature a study of the abstract, can only be assessed through concrete uses. Grasp of the abstract is often necessary before application is possible to the contextualised problem. Great post. I am hoping that the fact that assessment exemplification is only of one kind (child-led, play-based observation) because the other kind (teacher-led) doesn’t really exist at the moment! The worry is how to change the rhetoric if you were in charge of EYFS to be more proactive about providing teaching and learning for disadvantaged children without falling foul of the authorities’ requirements to make everything play-based? Snap! My daughter also attended two pre-school settings and so received two EYFS assessments of her learning. Neither bore any resemblance to the other, or indeed to my view of her capabilities. My view is that this is of little consequence in pre-school settings, where the only thing that really matters is the identification of serious learning/communication/social difficulties. But it continued into Reception year, where their baseline ‘assessment’ deemed she knew no phonic sounds and so she spent a term sitting on a table learning how to say ‘mmmmmm’. Meanwhile at home she had long ago learnt all her phonic sounds and was happily blending to read simple books. It is worrying. I have heard of data out there on the disparity between EYFS profile and later reading assessments. The pre-school assessment would be harmless if it didn’t take up so much teacher time. I worry about the opportunity cost of all that teacher time following children around with camera and post it notes or an ipad and hours spent analysing and collating the lot. Any assessment can only be on what is exposed. As we know most of our thoughts will never come to light as most of our life is secret and lived within our heads. Hence many children can be assessed as below and later in life flourish as talented and vice versa The accent should always be on feeding the pig and not weighing it . NOT. Literally of course as being vegetarian I love pigs. Rest assured that the DfE takes Article 12 very seriously–.after all, it’s another empire-building opportunity for early-years professionals. I had no idea of this. Surely though we can recognise and respect non-verbal communication without building a nonsensical assessment system around it? Article 12 established the right of all children to participate in making decisions that affect them. All schools in England are required to reflect this in their education plan, and I can assure you from personal experience that the DfE are quite zealous in the matter. This is an interesting piece from a specialist EYFS assessment perspective and I share some of your concerns around consistency. (As a point of information, a 3 year old should not be assessed under the EYFSP as it is solely for the end of YR. Why the setting referred to advice received from the LA on assessing a child of this age using it is a mystery). It is also a misinterpretation that all information needs to be gleaned from a ‘naturalistic’ context that is described. The ‘practitioner led observational assessment’ used for the EExBA Baseline made this clear and that some aspects of assessment generally require teacher interaction to glean the necessary information and I would argue that this is congruent with the statutory requirements for assessment outlined in the EYFS framework. I would argue that it is not entirely true that the principles of reliability that you cite cannot be met within this approach, and with effective and comprehensive moderation and a range of exemplification (and I accept your point that this often over focusses on Child-initiated activities) consistency can be supported and secured. Effective EYFS assessment requires the professional responsibility to use a flexible and responsive approach to collect the necessary information. However, as with many forays into critiquing EYFS assessment, there is an assumption that ‘testing’ in whatever form is more reliable. Although this may be true for older children, I am afraid that the evidence for this kind of approach for children aged B – 5 suggests that this is not the case. A good place to start might be with Meisels, S.J. 1993. 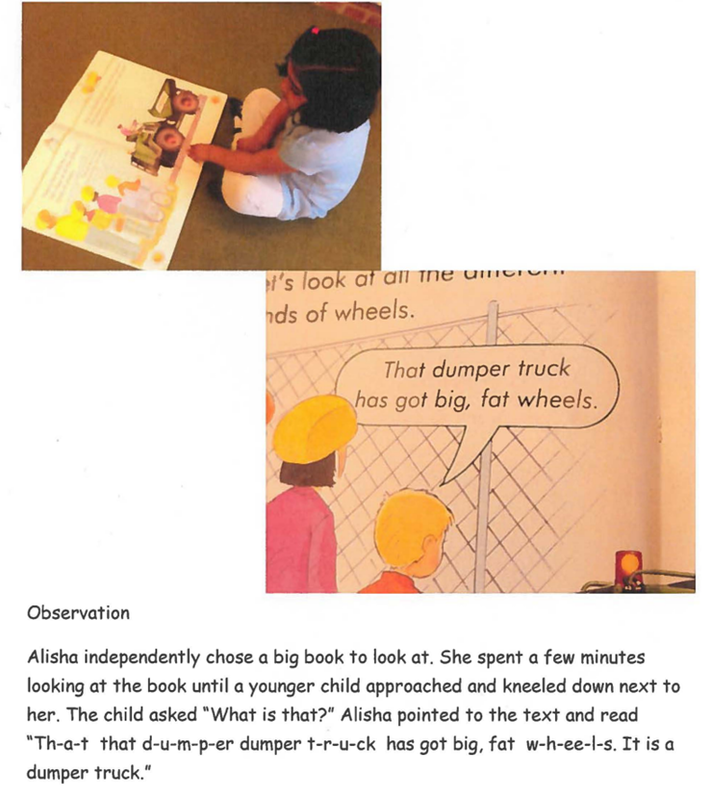 “Remaking the classroom Assessment with the work sampling system.” Young Children. 48(5):34-40. Testing young children in the way advocated by CEM and NfER rely on making huge assumptions about proxies for learning and knowledge that are impossible to prove, nor do they take into account the nature of children at this age, the range of perceptions they hold, the impact of previous experiences and the emotional dimensions of the child at the point that the test takes place and how this might affect their response. Elaine Mason’s work on the previous Baseline models (1998) demonstrated the inconsistent results children attained depending on the day of the week and the time of day. This was why the original FSP and its later manifestations used the observational model as tier core. I’d be more than happy to have a broader face to face discussion if you are interested in exploring the challenges and issues of assessment in the EYFS. As I stated, I do share some of your concerns from what you have described, but I also believe that there is a lot of misunderstanding of what makes for effective EYFS assessment – from both ‘sides’ – and in order to get it right; which is really important, there needs to be a genuine discussion. Thank you very much for your comment. I’ll reply properly later when I have more time but just to clarify. My daughter’s reading assessment was at the end of reception. In case anyone else is confused by this I will make this clear in the post. I also explain in the post that it is not the case that all information has to be gleaned from a naturalistic context but the strong priority on this is clear. Regarding the key points you raise. There is a debate to be had about using baseline testing of the sort offered by CEM and NfER and the onus is on those developing models of baseline testing to demonstrate their fitness for purpose. From what I’ve read it seems likely they can provide meaningful data at a cohort level but can’t be used to track individual progress but I haven’t researched this in detail and I’m quite open to be persuaded either way. However, I can’t see how the perceived weaknesses of one model can justify continuing with the EYFS profile or using another observational approach because these are clearly not fit for purpose – as I explain. Moderation and exemplification simply can’t overcome the issues I have raised over reliability (let alone the other issues that I will cover in subsequent posts). Exemplification and moderation aren’t a substitute for standardised conditions and can’t make up for gaps in what has been observed. I am not really trying to make an argument for CEM or any other baseline. Any possible failings of one approach don’t justify another. I am explaining why the EYFS profile is not fit for purpose because it does not allow the creation of a ‘common meaning’. there is a ‘common meaning’ which is expressed through the guidance, the exemplification and through rigorous moderation which takes place continually. The ‘common meaning’ in the EYFSP and EExBA is different to the one expressed through test data but is nevertheless valid and fit for purpose. Your critique focuses on what you believe to be the inconsistency of data from observational assessment; the ‘shared meaning ‘is clear and very separate to this. These conditions are required for realiable summative assessment and the EYFS Profile is unable to fulfil these criteria. These conditions are required for reliable summative assessment and the EYFS Profile is unable to fulfil these criteria. 3. The criteria consists of the content that defines the child’s knowledge in the specific area and is therefore representative. And forgive me, but I have never heard of Koretz. I may be wrong, but this could be because Koretz does not have a ECE focus. On the flipside, are you familiar with the work of Carr, Edgington, Hutchins, Pascal, Leavers, (and me)? As a EYFSP moderator I can confirm that ether is no requirement for all or most of evidence to be ‘naturalistic’ or child-initiated. In reality few schools are able to provide a majority of child-initiated evidence for EYFSP, particularly for Number, Reading & Writing. As a EY teacher I would say there is good reason for this and many children need strong adult guidance to learn the skills and knowledge before they are confident to explore and apply academic areas by themselves. Indeed, the EYFS covers the birth to 5 age range, and clearly states that there should be an increasing balance of adult-led, whole class teaching towards the end of the EYFS in preparation for formal learning. 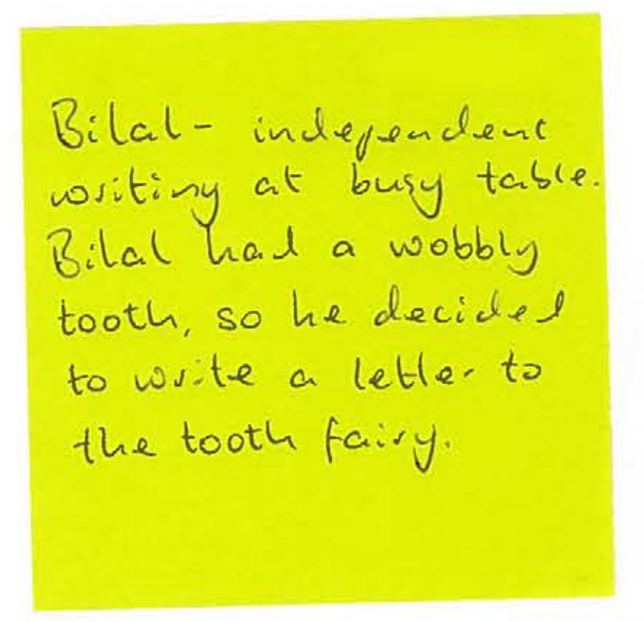 Where there is little evidence of independent behaviours, it would be usual to make reference to it in the moderation notes to the head that this is so, and to make sure this informs Y1 teachers an planning, as children may only be able to demonstrate knowledge & skills with adult guidance and support. The issues with teaching and learning in reception have more to do with a dearth of very poor synthetic phonics teaching in schools, and in YR in particular. 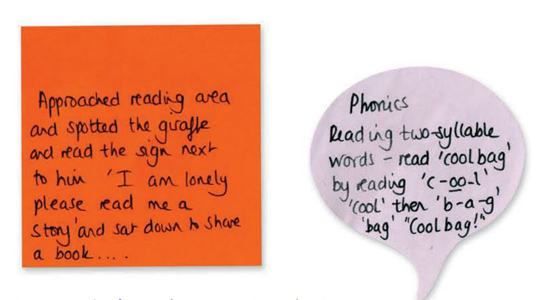 The EYFSP Reading and writing goals are explicitly about decoding, blending and segmenting, but all too often are marred by poor interpretation and top-down literacy, reading recovery benchmarking and lack of decodable schemes, that completely ignore the clear expectations of the Profile. This is a problem with schools not the Profile. It should be remembered that EYFS is what is says – a foundation. It should also be noted that a great many children enter reception without the foundations for learning, and must be given broad and balanced provision to ensure they have the opportunity to develop the communication & language, social and emotional, and physical skills needed to be able to have equitable access to year 1 learning. Thanks for this. I pretty much agree with all your sentiments especially regarding reading. The comments on here indicate that there is real variation in assessment practices. It is very important that the EYFS profile and exemplification materials are revised in line with your much more sensible approach. The interpretations being so wildly variable simply adds to the unreliability as assessments between schools in different areas aren’t therefore comparable. It would be marvellous if this also led to an end to the crazy ‘evidencing’ that reception teachers are required to spend their time doing. EYFS or any assessments of any young children are an assessment of that child’s progress at that time when being observed, not a test. Testing is never mentioned in any good practice early years documentation. Data is purely the notes that professionals use to provide evidence of progress made by an industry visual and not in any way similar to GCSE data or other. I have never read such nonsense. Clearly, you need to widen your knowledge of early childhood development before you are in anyway qualified to write a blog based on this. This is evidence to support the notion that the internet is full of nonsense! As I explain in my post the EYFS Profile is a statutory assessment used nationally to assess the learning of children up to the age of 5. The purpose of the EYFS assessment profile is ‘to provide an accurate national data set relating to levels of child development at the end of EYFS’. It is also used to ‘accurately inform parents about their child’s development’. As I explain in the post the sort of data you refer to is not fit for this purpose. I don’t see anything here that can’t be addressed via moderation and training. The EYFSP is an end of stage summary and it isn’t the only thing in education that is assessed by teachers… Even now, year six have teacher assessment for writing, for instance, and this will always be slightly subjective, as all assessment that is not based on a absolute rights and wrongs. That’s why A-Level papers can be remarked and graded differently. The reason that the majority of judgements in the EYFS are based on child initiated learning is because that is how young children (and, I’d argue, all children) learn best. If they spend most of their time learning that way, it makes sense to assess them that way. As they move up the school this isn’t the case (it should be, in my opinion) but this doesn’t mean we should change the way reception works to prepare them for it. That’s like trying to teach a newborn to walk, because they’ll have to do it later on. Yes, but they aren’t yet ready. We need to stop basing our ideas of Early Years learning and assessment on what the rest of the school wants or does and work for the best interest of our children. Thanks for your comment. Moderation and trianing do not solve the problem of ensuring ‘a shared meaning’ – they are not able to do so. The reasons why EYFS uses child initiated assessment are well known but unfortuantely the more naturalistic the assessment the less control there is over the conditions of that assessment. This is why the profile doesn’t meet basic criteria for reliability and validity. I suspect this means that he does not have a particularly ECE focus or specialism. It can be dangerous to generalise. Imagine if 16 year olds were assessed by observing them playing in the sand area; it wouldn’t really work would it?